Matt Alford has been a rock climber and mountaineer for most of his life. For the better part of three decades now, he’s been exploring the mountains near his home in Seattle and far beyond. Doing so has required logging countless hours and miles in a car. When that fact started weighing on Matt’s mind 10 years ago, he decided the solution was to start putting together Front Door Adventures: climbing and skiing trips accessed completely by bike and mass transit. Correction: In the opening of the episode I say that “Personal car use contributes relatively little to greenhouse gas emissions compared to industrial agriculture, airplanes, dirty energy and others.” This is an understatement of personal car, truck, and SUV use’s impact. According to the EPA, transportation contributed 27 percent of the total greenhouse gas emissions in 2013. Of that 27 percent, passenger cars, SUVs, pickup trucks, and minivans account for over half of the emissions generated. One of my qualms with outdoors sports such as mountain biking, skiing, hiking and climbing is the need to hop in the car and drive to do them. Though there are plenty of towns with great trailhead access out the front door, the majority of us make a few hours of driving part of the equation each weekend to participate in the sports we love. A little bit of driving is never the end of the world, but it certainly contributes to it. As such, it’s exciting to see people using bikes for adventures in the mountains. 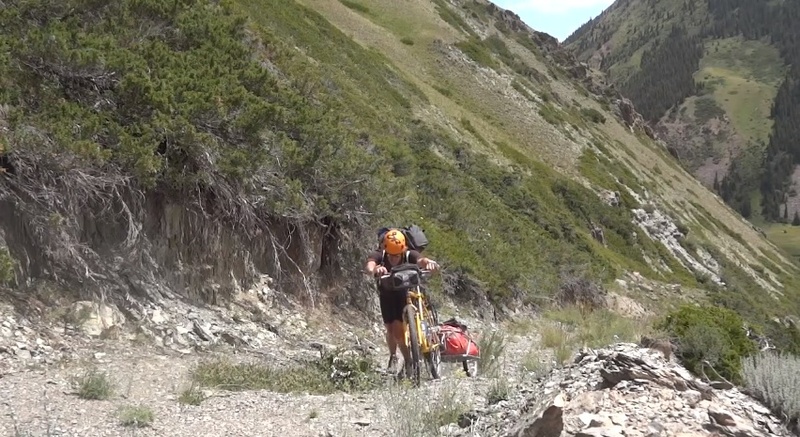 These three videos document a few different mountain climbing trips by bike, from the Great Divide mountain bike route to the high alpine in Kyrgyzstan. All of them center on weeks- and even months-long tours–certainly not practical for the day to day–but inspiration nonetheless about the possibilities for human powered adventure. Sam and Kurt are riding the Great Divide Mountain bike with trad climbing gear in tow.